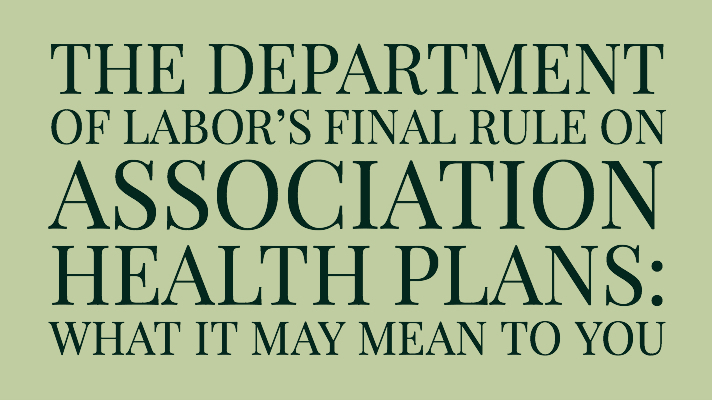 AHP (Association Health Plan) Final Rule, Who Might be Impacted? The Department of Labor (DOL) published a final rule on June 21, 2018; making it easier for a group or association of employers to act as a single “employer” sponsor of an Association Health Plan (AHP) under the Employee Retirement Income Security Act of 1974 (ERISA). The new rule is a 198-page document, therefore, we’re going to give you highlights and opinions of how it may impact consumers. The intent of the AHP final rule is to expand access to affordable health care for self-employed individuals and small business owners. The idea being that smaller entities can take advantage of economies of scale typically enjoyed by much larger employers. It should provide less expensive options for small businesses, industry groups, and regional collectives that may not have the ability to purchase health insurance via public exchanges. However, there is some concern that there will be fewer consumer protections that are included in Affordable Care Act (ACA) compliant plans. The final rule covers health benefits and AHPs only—it does not expand to include circumstances that allow employers and individuals to sponsor multiple employer plans providing retirement benefits or other types of welfare benefits. Who can establish an AHP? September 1, 2018 is the deadline for fully-insured AHPs and April 1, 2019 is the deadline for new self-funded AHP plans. The rule mandates only a “bona fide group or association” can develop an AHP. Payers, providers, and related healthcare professionals are prohibited from creating AHP offerings and from establishing an AHP as a bona fide group. The rule does allow payers and related organizations to provide consultation services that help to develop AHPs; as well as offer formulary guidance, provider network design, and claims administration. Acosta believes the final rule will provide more employee groups and families with affordable health plans, and avoid the rising costs of individual markets. There is opposition to the final rule, with claims that its true purpose is to disrupt the ACA’s marketplace. Christine Owens, Executive Director of the National Employment Law Project, i ssued a statement in response to the final rule, stating, “Today, the Trump Administration took a concrete step aimed at accomplishing what the American people do not want and Congress refused to do: roll back the protections of the Affordable Care Act (ACA). The Labor Department issued a final rule that radically expands access to largely unregulated health insurance through so-called Association Health Plans (AHPs). As a result, the administration has opened the floodgates to ‘fake’ health insurance, fueling the potential for a new era of widespread health insurance fraud and abuse.” New York and Massachusetts are planning to sue the Trump administration, arguing the final rule includes provisions that do not meet all of the ACA’s mandates. The AHP expansion could lead to many consumers leaving individual health plans in favor of AHPs. The Congressional Budget Office and DOL estimate that close to 400,000 individuals will seek enrollment in the newly expanded AHP marketplace. We recommend consulting with your benefits provider to see if the final rule will impact your small business. An AHP may be the best health insurance option for your company, or it may not. It pays to look closely at your options, to make the best decision for your business and employees.